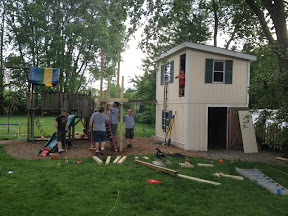 20120505 + Up in the am and tried to bribe J out of building an addition to the playset saying he could have anything he wanted. He asked for a lizard, so on with the building plans... L took D&G to get their baseball pictures taken, while J&I got in Docs truck and headed to Giant Eagle for beer and hot dog and Home Depot for supplies. Home by 11 and got everything unloaded and carried back. I had one fella and his son helping, plus DJ&G dig the holes for the uprights. 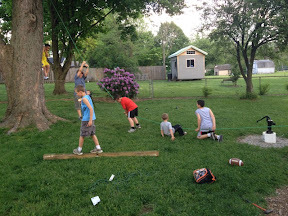 J guided the first beam into the hole and the build was underway... Soon L&D headed back to his scrimmage and the troops started showing up, 2, 4, 3, 2 - soon the backyard was full of kids and men playing an building. We had laughing, playing, building, hot dogs and beer. We worked until we couldn't see anymore and cleaned up with just a bit more work for tomorrow. Inside sore and slow. Boys to bed and cleaned up and to bed myself.